During aviation’s first 50 years, Long Island was the center of aircraft innovation and flight. 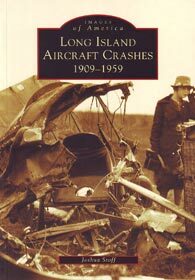 There were more aircraft manufacturers and airports located on Long Island than in any other part of the U.S. Due to high volume of air traffic, area also led the country in aircraft crashes. Daring flights, accidents, and mishaps of pioneer pilots, and the crash conditions are detailed. Long Island saw the earliest air-traffic control systems, airport lighting, aviation weather reports, paved runways, and professional flight schools. Mitchel Field, Roosevelt Field, Hazelhurst Field, Hempstead Plains, experimental flights, L.W.F. Owl bomber (the largest landplane of its time); the world's first instrument-guided flight are highlighted. 128 pgs, SB, 6.5 x 9.25, 200+ photos.